Retrofitting electronic gear will enhance the boating experience, says Kevin Green, and there is a wealth of new product out there. Upgrading the on-board smarts can seem a daunting prospect, both technically and financially, but it really can be worth the effort, especially when you consider the advantages. A 15-year-old system will have slow-starting radar, a spaghetti junction of different manufacturers' wiring, power-hungry cathode ray screens and the only thing wireless is likely to be the transistor radio for the shipping forecast. Given that most sailors want an easier time at sea with user-friendly gear, one way to start is by taking a top-down approach: what do you want to do on or in the flybridge? It could be more informative charts with 3D imaging and pilotage built-in – so, for instance, at the click of a button, several images of your desired port of call appear – or even a night-vision camera image. 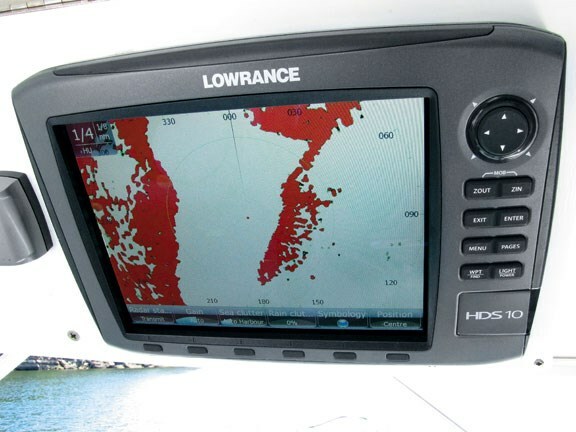 Sports fishers may want the latest underwater imagery to be overlaid, so you're looking at split-screen multifunction displays (MFDs) using the new CHIRP sonar from Raymarine or Lowrance. CHIRP technology gives boaters a much more powerful and defined image of their environment because it uses multiple frequencies to in effect sweep the water for targets. Unlike the single frequency pings from traditional sounders (typically operating at 50 or 200kHz), CHIRP uses multiple frequency pings (ranging from say 45 to 65kHz and 175 to 210kHz). Another useful function for fishos and even sailors is side-scanning imagery, so Lowrance's new HDS Generation 2 MFDs are worth a look. Radar has developed substantially during the last five years with digital (FMCW) radar sets giving broadband imagery, ideal for close-quarter manoeuvring, while the traditional magnetron-driven sets are favoured for longer-range target identification. 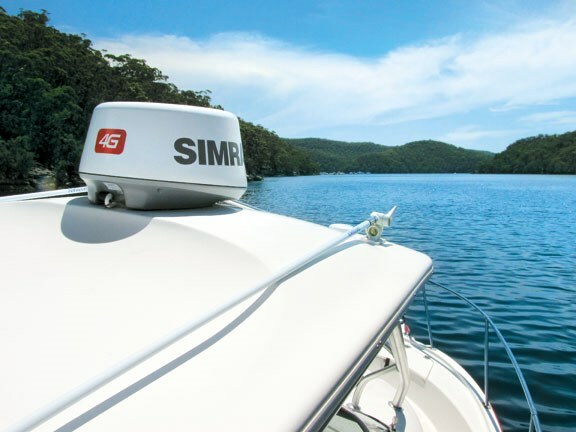 Pioneer in the FMCW technology, Simrad brought an upgraded version out late last year, dubbed 4G Radar that claims nearly a 50 percent increase in range (from 16 to 32nm) as well as dual-speed (36 and 48rpm). Using this system the other week I was able to clearly identify single targets within a tight group of boats and also pick out clear details of a marina entrance. Wireless is one area of marine technology that continues to move at pace, with increasing integration of Wi-Fi 802.11g and Bluetooth. Major benefits include MFDs wirelessly connecting to repeaters above deck, be they in dedicated instruments, tablets or smartphones. For instance, Raymarine's new e7, e9 and e12 MFDs allow an iPhone to become a repeater (after easy download of the Raymarine app from iTunes), while its four-inch i70 instruments gives AIS (among other screens) on bulkhead displays. The iPhone's big brother, the iPad, is becoming a popular navigation tool in its own right. Racing in Thailand recently our crew used the iPad onshore to input all the waypoints of each racecourse, go through tactical scenarios on the Navionics chart, and then at sea during the weeklong Phuket Bay Regatta, its in-built GPS worked effortlessly. Connecting all the on-board fixed gear together is the next step in a top-down approach. Many boats will have the old NMEA 0183 cabling installed, which is limited to a single pair of wires to receive only one input from its five output channels, unlike NMEA 2000 that supports 50 outputs and inputs simultaneously. A popular approach nowadays would be to install the computer data cable called Ethernet (or Category Five) for the graphics-heavy communications such as radar and 3D chart imaging, while data outputs, from AIS for example, could run on the lighter-weight NMEA 2000 backbone. For larger vessels, meanwhile, combined data/power backbones are used called CAN-bus. A bus allows all the smarts to be plugged into a single integrated system that can be quickly error checked, isolated and controlled from a single screen. I had a look at what can be done to an older boat last week, aboard a 15-year-old Newport 40, which electronic specialists BME had just finished upgrading with mostly the latest Raymarine gear. Overcoming the reticence of owners to cut yet more holes into consoles, easy-fit bezels are offered with Raymarine's new e-Series and the third generation c-Series button MFDs, allowing them to slot straight into holes left by the classic E-120, one of their biggest sellers dating back to 2005. In the saloon a brace of digital e7s, with ultra-bright LED screens were fitted instead of old cathode ray tubed (CCFL) screens, while up on the flybridge a pair of big e12s slotted into the existing console holes (with adapter bezels ensuring a perfect fit). Why two screens? Well, several reasons, such as allowing dedicated large-scale charting on one, while the second outputs a high-resolution image from the RD424HD radar. The 24in radome uses a 4kW magnetometer to precisely identify long-range targets, especially so that the small fishing boat about 10nm away over your horizon is shown-up well before you need to take evasive action. Other uses include overlaying the Navionics Platinum Charts with AIS and using the split-screen mode to show infrared camera output, ideal for those tricky marina entrances. Connecting all the new gear was done with Ethernet cabling in conjunction with Raymarine's Seatalk Ng (NMEA 2000 compliant comms). 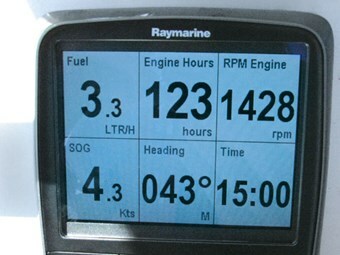 Raymarine said that supporting existing customers to move into the latest technology was a major part of the company's 2012 agenda. "Retro fitting, to take advantage of digital screens, HD radar and to clear away all those old analogue gauges, can now be easily done," Raymarine Asia managing director Ben Bowley told me.